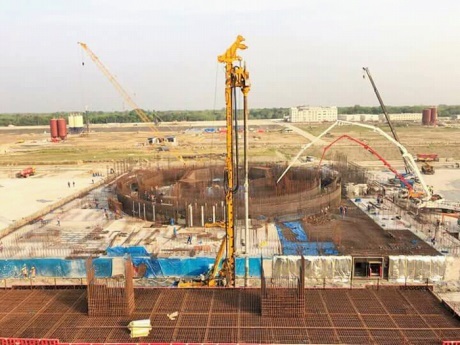 Russia's Rosatom has completed concreting the foundation of unit 1 of the Rooppur nuclear power plant in Bangladesh. ASE Group, a subsidiary of the Russian state nuclear corporation, said today the project to build the Asian country's first nuclear power unit was on schedule. Shawkat Akbar, project director for the Bangladeshi side, said similar work would start soon on the second unit. He added that, in accordance with a tripartite memorandum on cooperation in the implementation of the project to build Rooppur NPP, 50 young specialists from Bangladesh will be sent to India for training. The memorandum was signed on 1 March in Moscow by Rosatom's deputy director general for international relations, Nikolay Spassky, Bangladesh's ambassador in Russia, S M Saiful Hoque, and the ambassador of India in Russia, Pankaj Saran. Construction of Rooppur 1 officially began in November last year.